For your convenience, applications are available in MS Word format or PDF. 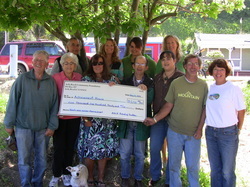 The Avila Beach Community Foundation was created to manage an endowment established as part of the UNOCAL beach clean-up settlement. Funds from the endowment may be made available each year for grant-making purposes in a total amount to be determined annually by the Foundation's Board of Trustees. The Foundation accepts applications for the funding of grants each year from July through September for projects to take place during the ensuing calendar year. The Board of Trustees review grant requests and determine recipients each fall. Funding of smaller projects may occur other times throughout the year outside of the grant-making process and calendar. Such requests may be acted on by the Foundation's Board of Trustees or Executive Committee in accordance with our by-laws. In the summer of each calendar year, organizations in Avila Beach and interested parties are invited to submit requests for the funding of projects to enhance the community of Avila Beach to be accomplished during the following calendar year. The Board also reviews and acts on other grant requests during the year. All requests are acted on by the Board of Trustees of the Foundation or the Executive Committee of the Foundation in accordance with our by-laws. The goal of the Foundation is to finance enhancement projects of minor amounts, major amounts, or co-sponsored projects with other organizations. Improvements in the physical, cultural and social well being of the residents and visitors of the Avila Beach Community. Enhancements beyond the services normally expected to be provided by government and private agencies.